This exciting image is what I've been tackling this evening. 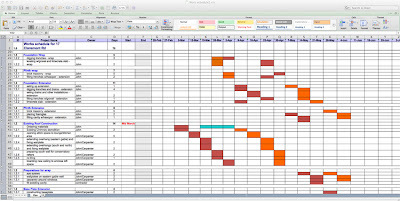 The spreadsheet was provided by the ever brilliant Kuba (project designer/strawbale consultant extraordinaire), for me to colour in the boxes. A coloured box indicates a chunk of time when a bit of the build should be happening. Piecing it together is a bit mind-melting but it is good to start to visualise the work involved, and see a potential progression from sitting here thinking about building to eventually finishing building and moving in! 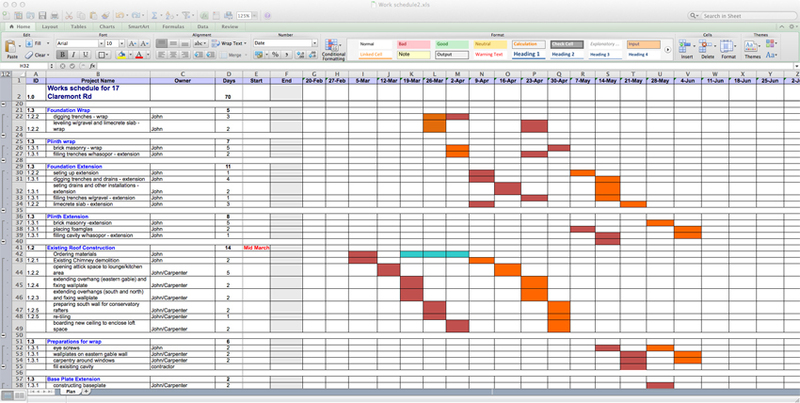 That final objective is a long way off yet, but the chart is equally useful for knowing when to start, what with, what to do next, and what needs to happen before other things can happen. It seems traditional in any build to get ridiculously behind schedule, so now we have a schedule we can follow that tradition with vigour.